“This is disgraceful. By withdrawing from the Paris Climate Agreement, the Trump administration has turned America from a global climate leader into a global climate deadbeat. The world has already resolved to act on climate, the renewable energy industry is growing exponentially, and people all over the globe are becoming part of the clean energy future. Progress will continue with or without Donald Trump, but he is making it as painful as possible for people around the world. He can't cancel a multilateral treaty signed by nearly 200 sovereign nations, but this decision shows he is determined to keep America stuck in the fossil fuel past while China and other nations become 21st century leaders. 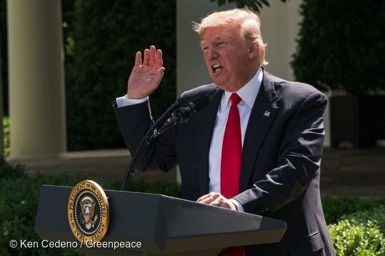 “Trump's isolationist stance at this critical moment in history is morally reprehensible, but his attempt to derail global progress on climate change will fail. 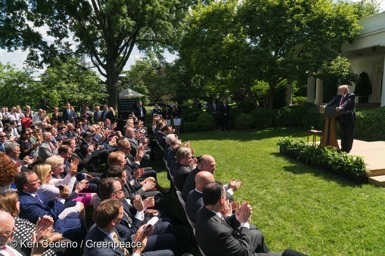 The Paris Agreement will remain in force, with or without the US government, and the transition to clean energy will continue.